My friend, Robert, came for a visit recently. We decided we’d record a song we’d written together. My lyrics gave me the inspiration to make this video.Ignore all the noise and shiny objects. Mitch McConnell gave away the game when he boasted a re-elected Republican majority would go after Social Security, Medicare, and Medicaid to pay for all the juicy corporate tax cuts. They’ll take away healthcare for an untold number of Americans. They would have done that already except for John McCain.Re-elected Republicans will end the Robert Mueller investigation and we’ll never know what happened to our democracy.All we are saying is get out and vote. 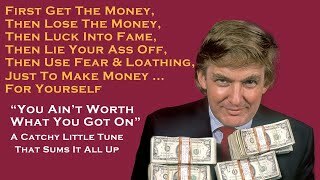 A catchy little tune with images to help remind everyone what's at stake when you vote on November 6, 2018. Healthcare. Pre-Existing Conditions. Medicare. Medicaid. Human Rights. And a president that believes the United States of America should be The Divided States Of Myself.